Brigit, I’m so glad you’re metaphorically holding my hand through this quilt project. Of course, I wish you were actually here because I’d find a way to get you to make the quilt for me. Ask any of my family members: I’m good at getting people to do stuff for me. But I did the work myself and have crippling carpal tunnel to prove it. I cut out 728 4×4″ squares over the weekend. Before I began, I was beguiled by the the term “self-healing cutting mat” that’s mentioned in all of my quilting books. It sounds so New Age, right? But 728 squares later, my cutting mat is anything but healed. It is rather gouged, in fact. Apparently I don’t have a light touch with the rotary cutter. Next purchase: Three hundred safety pins! My god. I love the fabrics–and looks like you did a good job cutting your squares. Did you wash the fabric first? I always do, but wonder if fabric would cut more neatly unwashed when it is stiffer. What’s the next step? Do you make blocks of four or nine squares? The pattern suggested not washing–all the more exciting to wash it and let it pucker into cottony goodness afterward. 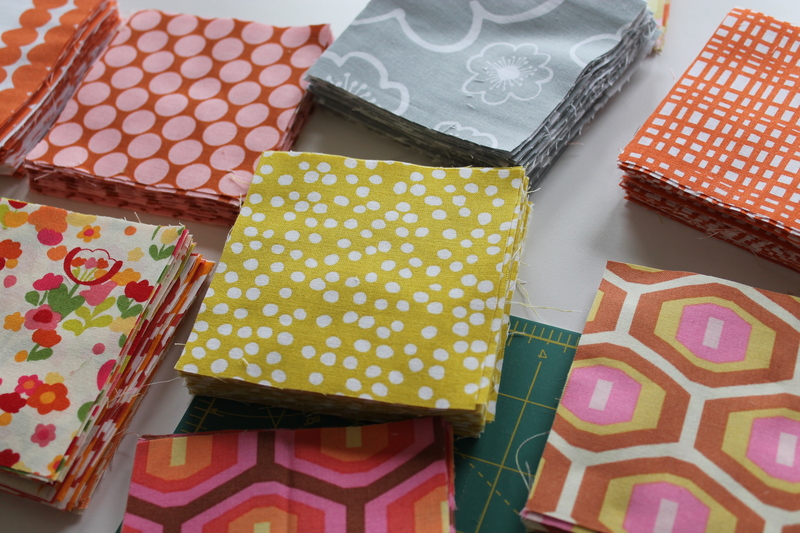 I still have some squares to cut and then I sew them into pairs–no squares!–and then into long rows. You’re supposed to select the squares randomly–should be interesting . . .